The advert will air at cinemas for the next few months. The advert is part of Quality Meat Scotland’s (QMS) £500,000 Know Your Beef promotional campaign. It aims to highlight the credentials, quality and sustainability of Scotch Beef, while setting out the facts behind beef production. The advert, which will run in cinemas until October and reach an audience of more than 600,000 cinema-goers, will be played before films including Wild Rose, Yesterday, Rocketman and Downton Abbey. “Although the new advert is already being shown on TV, we are so excited to take it to the big screen and show it to wide audiences across the country,” said QMS marketing manager Kirsty Fox. “The narrative we chose really makes the story feel like a performance so it’s fitting to take it to cinema audiences who are eager to see something special. 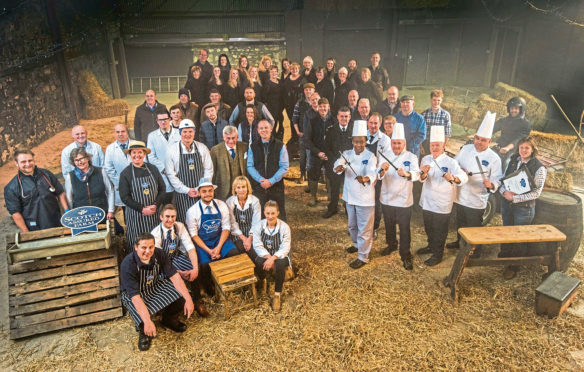 The 40-second musically-themed adverts features butchers, farmers, chefs, auctioneers and vets, as well as singers from the Scottish Association of Young Farmers’ Clubs, the Scottish Women’s Institute and the Royal Highland Education Trust. QMS said the Know Your Beef campaign, which also includes billboard, print, social media and digital activity, is expected to reach up to four million adults over spring. Its main focus is to tell consumers what sets Scotch Beef apart from the rest and highlight the industry’s environmental and welfare credentials.